Well, the 2011 Zymurgy Best Beers in America poll recently came out, so it is time to close out my quest to work my way through the 2010 list. In case you don't remember, last June (Best Beers in America) I shared the 2010 Zymurgy Best Beers In America Poll. At that time, I had never had numbers 1 through 4. Out of the top 10, I'd only had 2. Out of the top 50, I'd only had 8. That is pretty sad for a supposed craft beer drinker. I made it my quest to try more of the beers. I don't know if I ever stated the exact goal, but I always had it in my head that 8 of the top 10 and at least half the beers on the list would be respectable. I have not progressed on the list since I posted Update on "My" List" in December, so the information I posted there is the same. As I said then, I've had all of the top 5. I've had 9 of the top 10. I've had 25 on the list of 50 (actually there are more than 50 on the list due to ties at 49). I'm pretty satisfied with those numbers. I blogged about some of the beers on the list. Between the blog "labels" Zymurgy BBIA and GABF, you can find most of what I wrote specifically about the beers on the list. 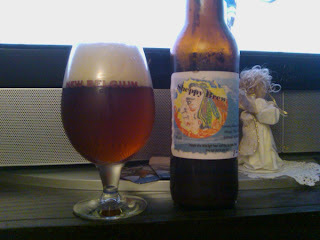 Of the 2011 Zymurgy Best Beers in America poll, I've had 3 of the top 5. I've had 8 of the top 10. I've tried 23 out of the whole list of 52 beers. Most have been checked off because they are repeats from the 2010 list. There are a few that I think I tried at GABF last year, but don't remember for sure. I'll just count the ones I know for sure that I have tried. I don't know what my goal should be this year. Since I am starting with a higher count this year, the final count should be higher too. I certainly want to try Founders Kentucky Breakfast Stout and Bell’s Hopslam (the two beers in the top 10 I have not had) before the 2012 list comes out. Neither brewery distributes to Colorado, so I will have to attempt to get those at GABF this year. At the moment, I think trying 16 more of these beers is a reasonable goal. That will put me at 39 of the 52 for a respectable 75%. Last year, Rahr and Son's Brewing Company was all over the list (12 of the 50 beers). This year, they have no beers on it. As I mentioned in GABF Final Session and Random Thoughts, I tried two of their beers at GABF and was not really all that impressed with either one. I read somewhere last year that patrons of Rahr and Son's had some sort of campaign where they "stuffed the ballot box". I'm glad this did not seem to happen this year. Anyway, stay tuned. I'll try to let you know what I think of the beers I try. I'll certainly blog about the total numbers. One of the perks of being an AHA member is that I got to purchase GABF tickets before the general public. The member's "pre-sale" went live at 10:00 AM on Tuesday June 28th. By 10:05, I had my tickets ordered. An even better perk is that I will be able to get through the members only entrance, which (based on last year's experience) will save me a considerable amount of time getting into the event. I stole this picture from the GABF site photo page. 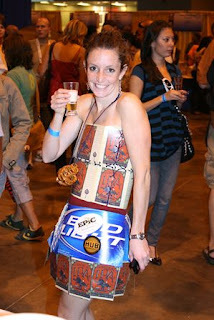 One of the cool things about attending GABF is seeing all the interesting costumes. Of course, the sexist chauvinist pig that I am, my favorites were worn by women. I thought this year, the SheppyBrew Beer Model would like to wear some sort of Beer-Wench-type costume. I even pointed her to some possibilities on Amazon.com . She has informed me that she will not be purchasing a Beer-Wench outfit for the festival. She is planning on wearing her Stone Brewing Company "You're not Worthy" tee shirt, which is a pretty good choice too. It is beer related and it does show off her chest nicely. Of course, GABF doesn't take place until the end of September. It does always sell out, but I probably didn't have to purchase my tickets right when the pre-sale started. We certainly don't have to nail-down our outfits for the event, yet. Just thought I'd share that I have taken the first step to attend this year. One disappointing thing is that Mr. Beer is not planning on attending this year. I actually had fun helping out in their booth last year. I guess I'll have more time for beer sampling now that I won't be covering the booth, but I was planning on spending some time with them this year. Oh well. If you would like to partially re-live my GABF experience from last year, check out GABF Final Session and Random Thoughts and the links on that blog post. I'm sure I'll blog about this year's GABF as well. 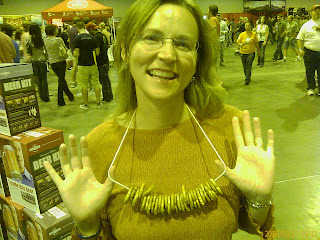 Beer Model with the pretzel necklace. Another great outfit from last year's event. I stole this from the GABF picture albums. Well, I guess today is this blog's 6th anniversary. On June 27, 2005, I made my first blog post. I still am not sure why I blog, but I must have some subconscious reason if I've lasted this long. Despite the fact that my blogger stats tell me differently, I still sometimes feel no one is reading this blog. I'm a terrible writer and really don't have much interesting to say. The blog lacks any type of focus, so even if a particular reader finds one of my posts interesting, chances are the next one will be so utterly uninteresting to that same reader that they will stay away forever. I guess as I am listed on the "Complete List of Beer Blogs" on the Beer Bloggers Conference website, you might call me a beer blogger, or at least a home-brew blogger. "Brewing" is certainly the most common tag on the blog. But then, there is just too much random junk on here to call it a beer blog, isn't there? My second most common tag is "Kids", which doesn't really fit with brewing at all (although it is surprising how often my blog posts include something about my kids AND something about beer. One sort of cool thing about this blog for me is going back and looking at old posts. 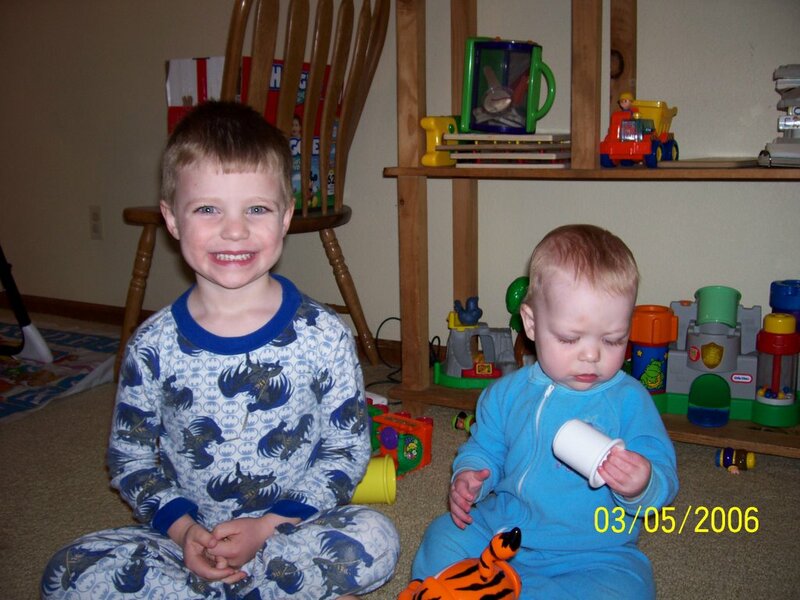 And one thing that is interesting about looking at the old posts is seeing how much my kids have grown in what seems like such a short amount of time. Not sure how someone came across that post after all this time. But seeing that made me want to look. It struck me how little Connor was back then (as compared to now). After I watched the video, I spent some time looking through other pictures of the kids I've posted on the blog. 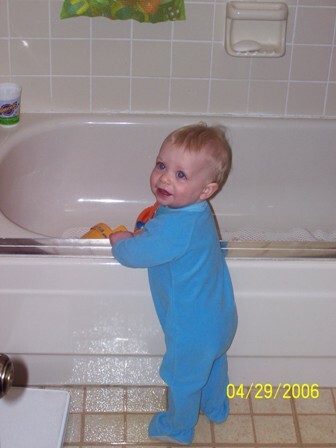 I guess I did not do quite as good a job of posting pictures of the kids here when they were really young, but here are some I did come across a few. 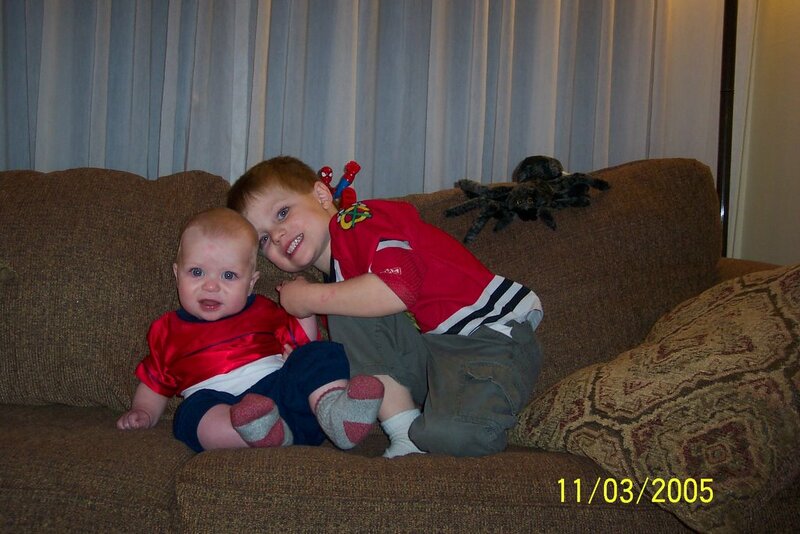 Isn't it amazing how much they have grown ... or is it just me, a sentimental father? Well anyway, happy anniversary everyone. P.S. For what it is worth: last week, my "stats" told me that the blog had reached 10,000 "page reads" since blogger started the stats feature (July 2010?). I suppose that indicates that someone is at least seeing the blog. Apparently some fathers spend Fathers' Day away from (as a break from) their kids. This seems like a really weird concept to me. My fathers' days are always full of activities with the kids. This year, the boys decided they wanted to take me camping for fathers' day weekend. At first, Mommy was going to be in charge of reserving the campsite, but would not be coming along. At some point the boys decided she should come with us so she could be in charge of getting us to the actual Fathers' Day activity. I am glad they decided to bring her along. Fathers' Day would have been too much work without her. 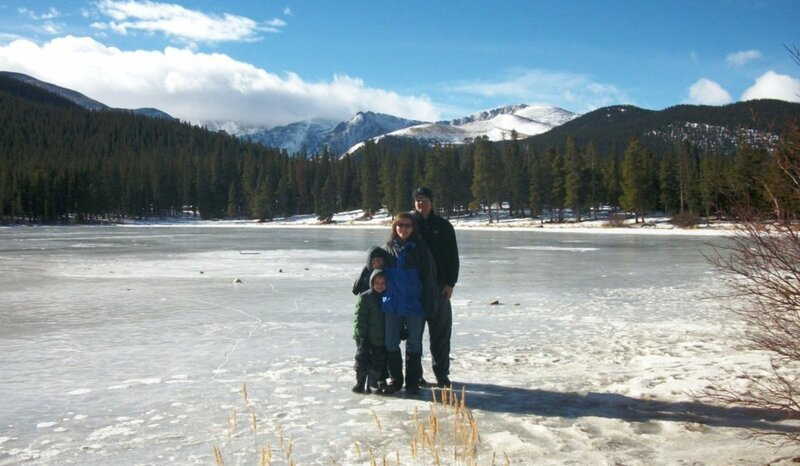 The campsite that Mommy reserved was in the Kenosha Pass campground, which is at 10,000 feet is about an hour and a half drive from our house. Tracy was a bit concerned as we were driving there Friday night that it would be too cold up that high. I, of course, scoffed at such an idea. The campground itself has undergone tree-clearing recently. A bunch of the pine trees were victims of the dreaded pine beetle epidemic. The nice thing about the tree-clearing effort is that it resulted in a bunch of free firewood, so we were able to have bigger, longer lasting campfires than we usually allow ourselves. This area happens to have lots of aspen trees, so the cleared out trees didn't necessarily make the area look as bare as an it could have. Saturday morning after cleaning up from breakfast, we packed up a lunch and started hiking the Colorado Trail. 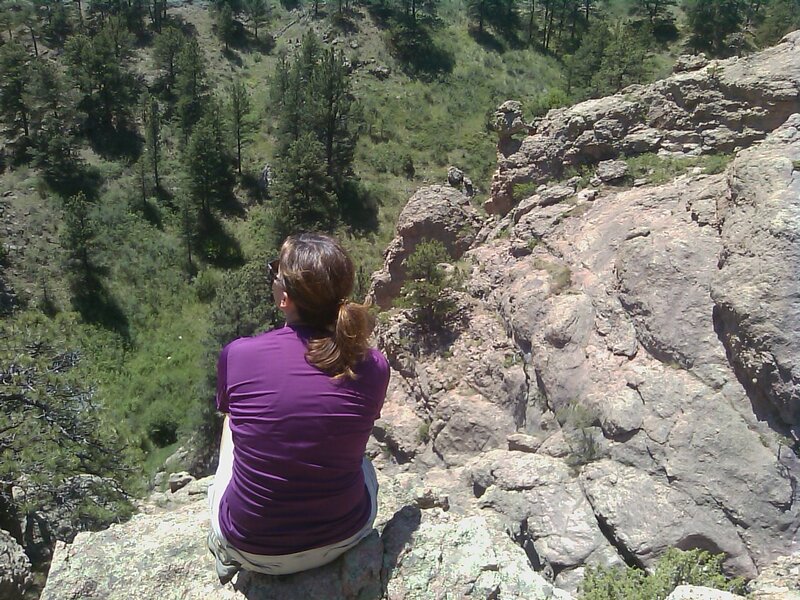 For those of you who don't know, the Colorado Trail runs about 500 miles from Waterton Canyon South of Denver to Durango. The trail passes over Kenosha Pass, and practically goes through the campground. 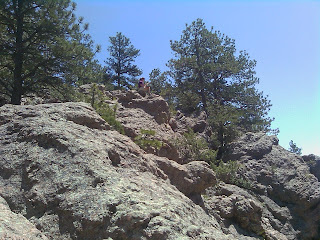 Before we could start our hike, we (of course) had to climb some of the rocks by the campground. Dad told the kids there would be plenty of rocks to climb on the hike. Turns out that Dad lied. 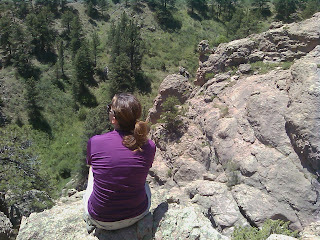 There were no good climbing rocks along the portion of the trail on which we hiked. We did come across a couple of shelters built out of sticks along the trail. The most impressive one is the one to the right here. Someone obviously spent a bunch of time building this shelter. We saw some mountain bikers and backpackers along the trail. Both the boys tell me they want to go backpacking soon. I am glad to hear that, but I am a bit skeptical that they will actually enjoy backpacking once they are actually doing it. They insist they want to, though, so I will try to accommodate the request. It was a nice sunny day. It also wasn't overly hot. The perfect day for a hike. The views were very nice too. We had a nice picnic lunch along the trail. Then, we headed back to the campsite to relax for awhile in the afternoon until supper time. Mommy even played her guitar for a bit. We had another great big campfire at night with the free firewood lying around. Usually on Fathers' Day, I get breakfast in bed. This is impractical in the tent, but my wife did make us pancakes and sausage. I did have to help pack up the camp on my "special" day, but at least I didn't have to do dishes. After packing up the camp, for my official Fathers' Day activity, we headed over to Fairplay Colorado to go to South Park City. South Park City is basically a restored 1880's mining town. Its buildings were relocated from various ghost towns all over Colorado. We went on the self-guided tour through the town and its buildings. It was very interesting and we all had a good time. There was a recreation of a mine. There was a train. The kids had fun climbing on the locomotive and the caboose. The school house was a hit. We got to go into an old-town bank that had been relocated from Alma, Colorado. The whole camping trip and ghost town tour made for a great Fathers' Day weekend. The boys and their Mom did a great job setting everything up, and I had a wonderful time. I guess I am under some pressure to help the boys come up with what to do next Mothers' Day. The Beer Model and I have a kid-swapping arrangement with another family. They have two boys the same age as our two boys, and a few times a year we take their kids for a weekend. Then, they take ours for a weekend. This past weekend, we were without our kids. 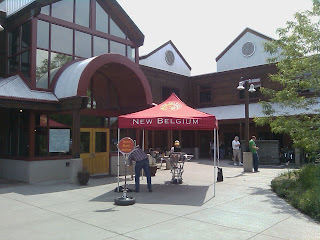 I had been wanting to do the New Belgium Brewery tour for quite awhile. 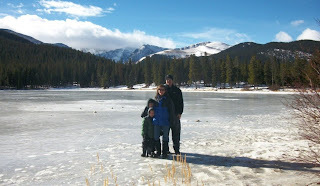 But, it is a long drive to Ft. Collins and dragging our kids along to do that just didn't seem like a good idea. Knowing we were going to be without the kids, though, seemed like a good idea to go ahead and do the tour. 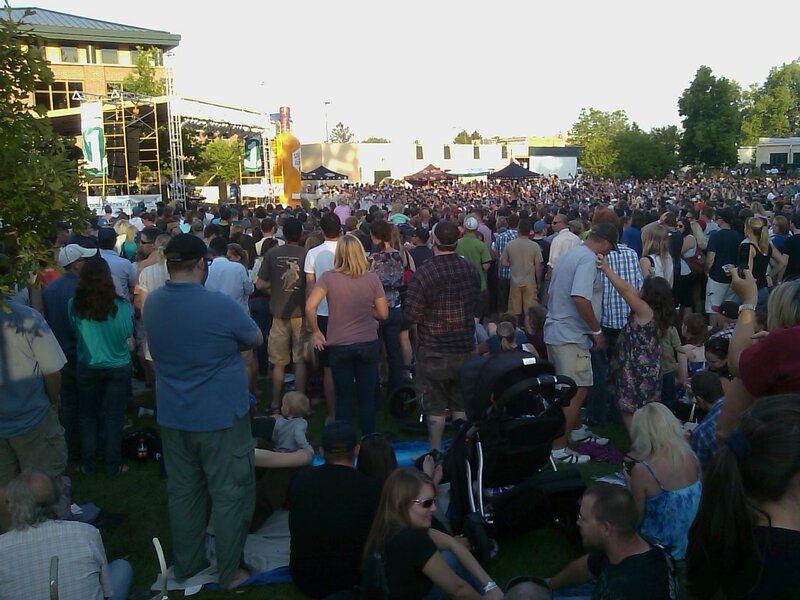 But, the New Belgium tour is a pretty popular thing to do. They take tour reservations and their weekend tours are full for months into the future. Tracy called to ask if we showed up what the chances would be to get on a waiting list for any cancellations or no-shows. When, the Beer Model mentioned that her husband and she would be without the kids, the person she talked to told Tracy that she also had three kids and would get us on a tour. And she did. Awesome. We got the earliest tour time (11 AM) so we could fit in some tours of other Ft. Collins breweries. 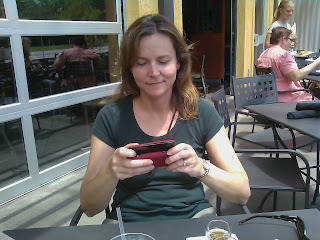 We got to Ft. Collins around 10 AM, parked our car at our hotel and walked to the New Belgium brewery. It was a nice walk around a mile, and we got there in plenty of time. As it turned out, a group of 20 did not even bother to show up for this tour, so we would have easily gotten in. Of course the tour after ours looked VERY full, so I am glad we had the peace of mind of having an official reservation. There were quite a few people on the waiting list who were happy to find out that 20 spots opened up. The New Belgium brewery tour is absolutely without a doubt the best brewery tour I have been on. 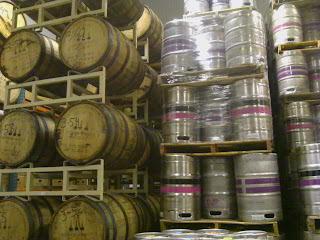 My only complaint was that Bernie (our tour guide) kept throwing all these cool benefits about working for New Belgium that made me absolutely jealous. Of course, the New Belgium story is famous. And, it is a great story, but, somehow it sounded even better when Bernie told it. 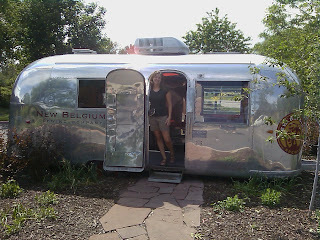 The tour includes 6 good-sized samples of New Belgium beer. The samples included Abbey Grand Cru, Super Cru, and even La Folie, so it is not like they held back the good stuff. Of course as someone who actually does brew, seeing their brewing equipment and hearing about their alternative power sources and brewing efficiencies was down-right fascinating to me. 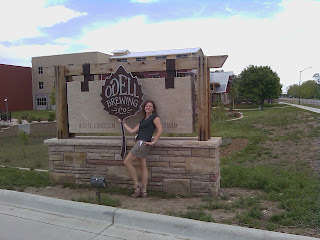 So, if you are ever going to be in Ft. Collins, Colorado and need something to do, try to get a brewery tour. As I mentioned, they take reservations and those spots fill up quick, so sign up early. Here is a link to their tour calendar. I was able to use my AHA Membership "Pub Discount" in their tasting room. I bought a hat for 15% off, AND they gave me one of their globe glasses free with the purchase. That is a great little discount. I think I might have paid for my AHA membership for the year with this trip alone. 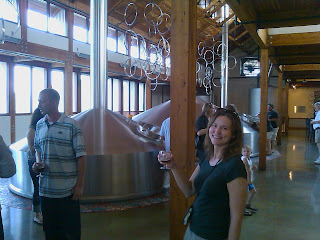 After the New Belgium tour, we walked 10 or 15 minutes to Odell Brewing Company in hopes of getting their 1PM tour. We did not get there quite on time, and they would not let us sign up for their 2PM tour yet. And, we were hungry. 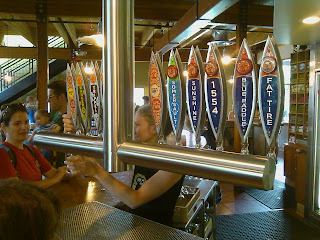 Neither the New Belgium tasting room nor the Odell tasting room serve food. 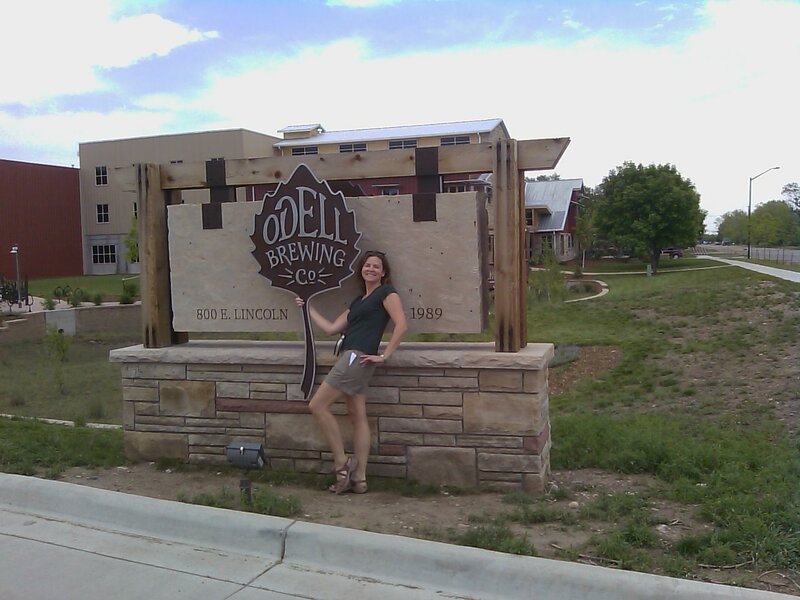 But, the girl at Odell told us that Ft. Collins Brewing company had a brew-pub on-site, and it was within walking distance. We decided we had really better get some food, so we headed down that way. The restaurant in front of Ft. Collins Brewery is called Gravity Ten Twenty. Their food was awesome for a couple of starving brewery crawlers. We got a couple of sampler trays to sample a wide range of the brewery's beers. Tracy got a chance to update Facebook with pictures and status updates etc. It sure took her a long time to do it. I'm sort of regretting letting her get a smart phone, but it is too late now. Neither Gravity Ten Twenty nor Ft. Collins Brewery are listing on the AHA website as participants to the AHA Pub Discount program, but I asked the waiter anyway. He had to ask his manager, and we did end up getting a 10% discount on our lunch. With food in our tummies, we headed back to Odell to sign up for their tour. I got a hat there and used my AHA card there to get 10% off the hat and a FREE sample tasting tray. We had a little over half an hour until the tour, so we had plenty of time to do our tastings. Odell has some great beers, but their tour is nothing compared to New Belgium's tour. The tour guide was not nearly as entertaining as Bernie. Plus the tour itself just was not as interesting. They didn't even give us free samples. Oh well. It was still worth it for me. 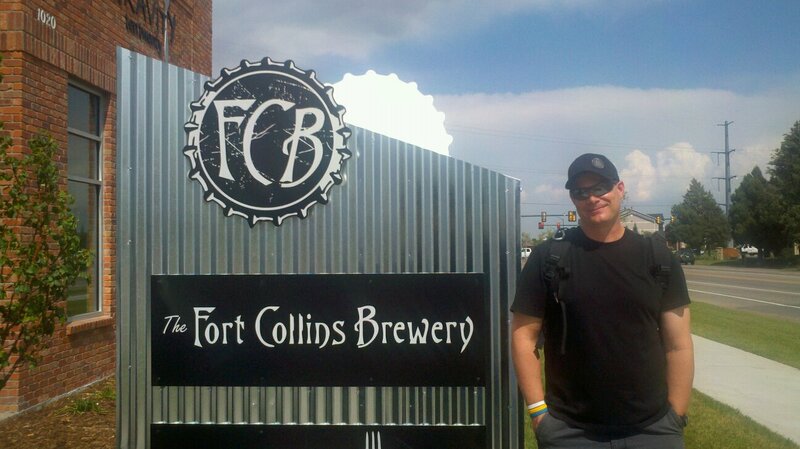 After the Odell tour, we headed back over to Ft. Collins Brewery. Again, we had plenty of time before their next tour, so I used my discount to help pay for another couple of taster trays for Tracy and I to share. Whenever we share taster trays, we each taste all the beers. Then, Tracy claims one or two that I am not allowed to drink, and I get the rest. The Ft. Collins Brewery tour is certainly nothing to brag about, either. One of the bar-girls shouted out for anyone who wanted to do a tour to follow her. It was pretty obvious very quickly that she really didn't know much about the brewery (or brewing in general). But, it turns out one of the brewers was following along as well, and he took over. I actually had fun talking to him talking about some of the geeky details. I'm sure no one else on the tour enjoyed it as much as I did. One thing about that tour that still blows my mind is how small their mash tun and brewing kettle are. To fill their bigger fermenters, they have to do their mash and boil three times. I asked the obvious question about if / when they are getting bigger ones. The brewer showed me where those are going (as soon as they can find time to set them up). Honestly, Ft. Collins Brewery seemed like more of a larger scale home-brew setup to me. Amazingly, these guys distribute to about 10 states. There is nothing wrong with their beer, though. I'm just amazed how such a small-feeling brewery was able to keep up with demand in such a wide geographical range. So, that was our last tour of the day. After Ft. Collins Brewery, we headed back to our hotel and checked in. Then we headed back towards where we had come from to eat at a local brew pub Cooper Smith's. He had a nice dinner with another couple of beers. One of the beers I had there was a green chili beer, which I thought was pretty good. Tracy was not a fan, but then she never does like unique and interesting beers. After dinner, we got into "Taste of Ft. Collins". We wandered around a little bit, and then got to listen to Third Eye Blind, who were the headline act of the night. After they were done, we headed back to the hotel. NOTE: I was going to put a video of 3eb in this post, but I didn't really like how it turned out. Instead, here is one someone else posted to YouTube: http://www.youtube.com/watch?v=eKcklm5HXa8 we were much farther away. Third Eye Blind is in the distance of this picture. Sunday, we slept in for awhile with no loud kids to get us up. We had a leisurely breakfast and then headed over to a local park for some hiking. My wife up high. Can you see her? We got back to get the kids around supper time, so we let the the family who had taken care of the kids feed us brats and potato salad. They even started up a fire so the kids could have roasted (and non-roasted) marshmellows. I think we all slept well that night. So, I cannot really say that I have been following Anthony Weiner's story all that closely. It does fascinate me that a U.S. Representative could be so incredibly stupid, but the details of the whole thing don't really interest me that much. 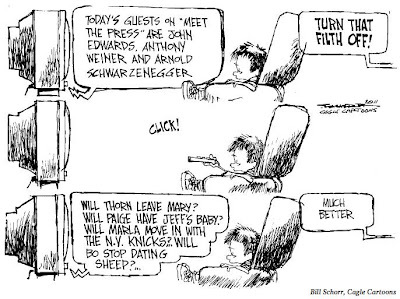 When I saw on my google portal the headlines that Weiner's wife is currently pregnant, I shook my head, and the guy with whom I share an office at work wondered what I was reacting to. We talked about it a little bit, and a few minutes later, he started laughing. He had googled Weiner and saw the quote: "I can't say with certitude if it's my crotch". Obviously, I have been aware of the story, but as I mentioned above, I have not really followed it closely. I had not seen that quote, and, it made me laugh too when my co-worker read it aloud. It is difficult for me to imagine anyone ever having the need to say, "I can't say with certitude if it's my crotch". I can say with 99.99% certainty that I will never need the phrase "I can't say with certitude if it's my crotch". Call me boring, but I have never had the desire to take a picture of my own crotch. I have also never had another person with a camera close enough to my crotch to get such a shot. Additionally, if either of those two things were to happen, I am pretty sure that I would remember the event well enough to identify the picture. Plus, I would never ever say the word "certitude". 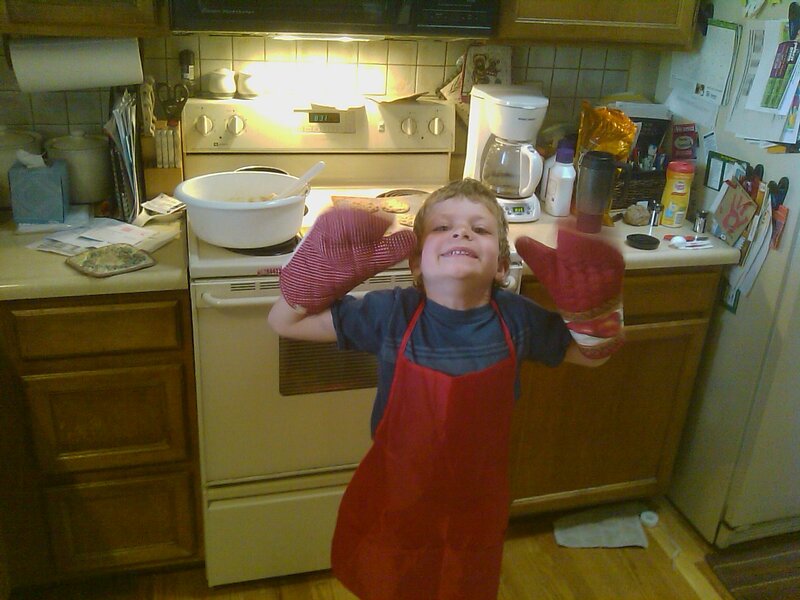 Connor has been bugging me for quite awhile to make cookies with him. Saturday, while I was giving blood, he finally gave up on me and convinced his mother to make cookies with him. The picture to the left is what I came home to, a little baker with oven mitts and an apron on. He is a pretty cute chef. Just for the record, I was planning on making cookies with him this weekend. We just have not had time the other times he has asked. But, that is not what this blog post is about. Today, we are talking about Sunday's brew day. 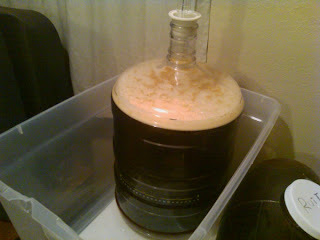 On Sunday, I brewed up my Quarter Life Crisis Hoppy Red Ale. It is really hard to declare any home-brew a favorite over another. 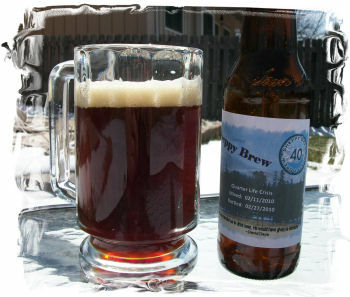 As I've heard quite a few brewers say when asked to name their favorite beer, "my favorite beer is the one in my hand". But, if you made me tell you my favorite beer, usually my answer will be Quarter Life Crisis. 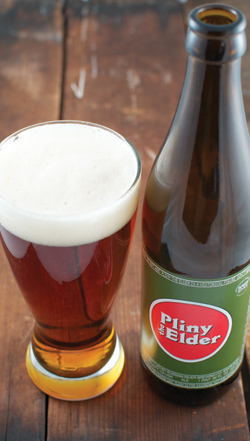 It is big and hoppy with a malt complexity that IPAs just don't have. I love the Imperial (or West-Coast) Red style, and I think my Quarter Life Crisis is as good as any commercial example of the style. I like it very much. But, at the moment, I only have one Quarter Life Crisis in my inventory, and I've been telling myself for quite awhile that I need to do another batch. On Thursday, I finally stopped by the Brew Hut and purchased ingredients to brew another batch so that I could brew it Sunday. And, that is just what I did. This batch was my first all-grain version of QLC. It was also my first 5-gallon batch of the recipe. One of the reasons I switched to BIAB was because my 5 gallon mash tun would not be big enough to do full-sized all-grain batches for my higher alcohol beers. My 8-gallon brew pot is obviously bigger than my 5-gallon tun. The brew day went pretty well. I hit all my gravity numbers at acceptable volumes, but I think ideally I would have an even bigger vessel for mashing the grains for this recipe. My 8-gallon brew pot was great for mashing Gringo Cerveza Jalapeño Cream Ale (1.046OG, 4.69% ABV) and Summer Lovin' American Wheat (1.052 OG, 5.99% ABV), but QLC has an OG of 1.072, and you might be able to tell from the picture to the left, that much wet grain is pretty bulky. You probably can't tell from the picture, but might be able to imagine, that much wet grain is also very heavy. I was able to fit the grain plus about 6 gallons of water in the mash. 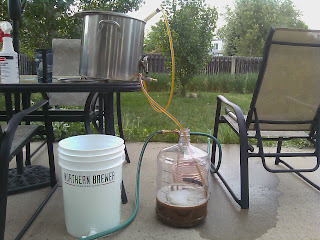 That left almost 3 gallons of water for a sparge, which I did in my 5 gallon mash tun. The fat, heavy, wet bag of grain was difficult to get into the gott-cooler, and I spilled some of my precious sugar-filled wort moving the bag to the sparge vessel. 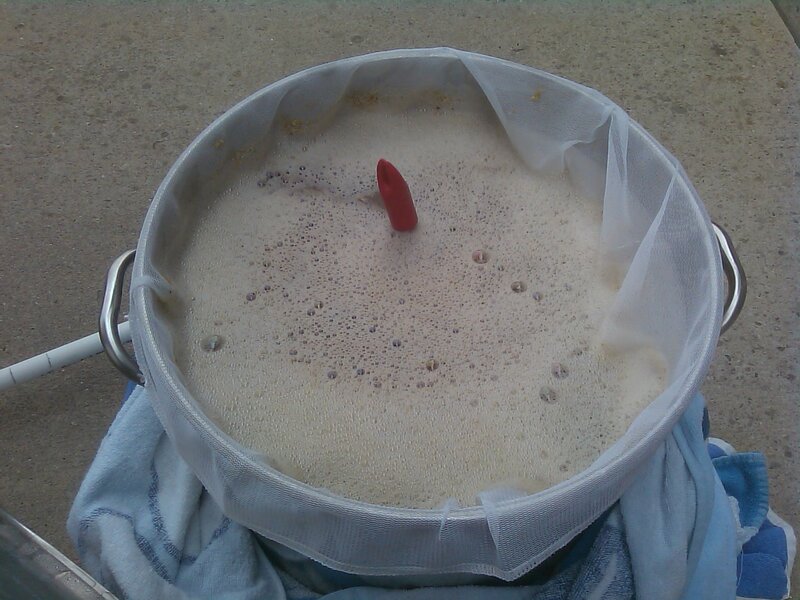 Like I mentioned above, I hit gravity numbers, so it did not cause any kind of real problem with the resulting wort. It was just more difficult than it seems it should have been. The boil went well. Absolutely no issues over the 90 minute boil. 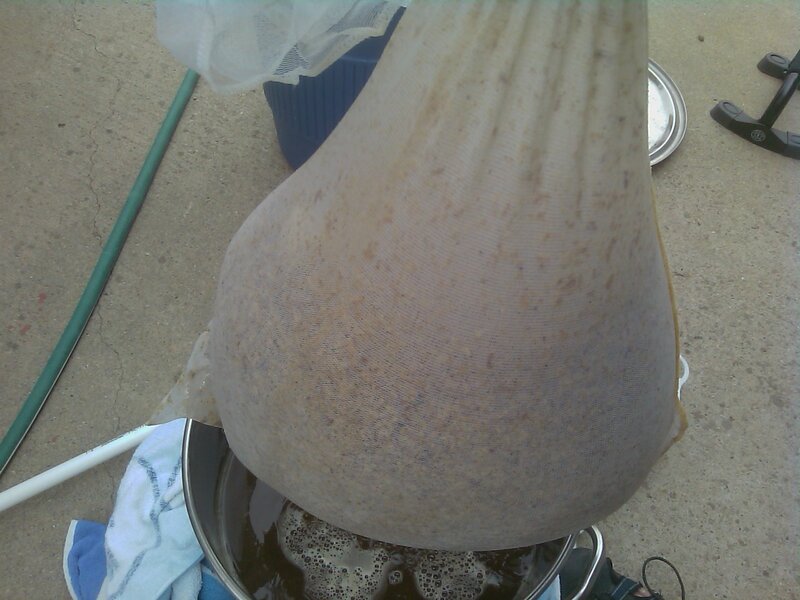 One thing I did a little differently this time was I used another bag to hold the flavoring hops in the boil. The bag was smaller than the BIAB bag, but bigger than the hop sacks I've used sometimes in the past. The idea here was to easily filter the hop material (there are a lot more hops in this recipe than any of my other recipes), but still allow the hops to "swim free" for the most part, allowing decent hop utilization. The filtering part seems to have worked really well, and I think I got more wort because of considerably less gunk on the bottom of the pot. Not sure how my utilization actually compared, but the wort sample did taste hoppy, so I guess it was decent. It was a hot, sunny day in the upper 80's or maybe even in the 90s, and my chiller did not get the wort as cool as I would like. 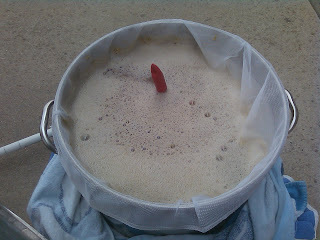 As I mentioned in Beer Model Brew Day, I might want to invest in a pre-chiller to help chill on these hot summer days. I would put my pre-chiller in an ice bath so that my chilling water would be much colder. I think that would help quite a bit, but I don't know how much colder I'd be able to chill with this pre-chill method. This time, though, what I ended up doing was putting carboy into my chest freezer for about half an hour (might have been more). This got me from about 72 down to around 62, which is a perfect pitching temperature for an ale. Note, I do know that lots of brewers will say that 72 is a perfectly acceptable pitching temperature. I just have had better results when I pitch either right at or a little bit lower than fermentation temperature, and I've had much better results starting fermentation in the low 60's than I have had fermenting at or above 70. So, I guess until I make or find an inexpensive pre-chiller, I have an acceptable plan - B. Now, back to brewing the bigger-gravity SheppyBrew all-grain recipes, I am back to thinking that I need a 10-gallon gott-cooler to use as a mash tun. But, I am sort of thinking it would be just fine to use my BIAB method inside the cooler so that I don't have to do any modification on the cooler. Not only would this mean less up-front work, but also, one of the things that appeal to BIAB for me is that there is no danger of a stuck-sparge. All-grain wheat and rye beers and beers to which I add flaked oats will not have that risk. I suppose I'm just a bit gun-shy after the last time I tried to brew Phat and Tyred Ale (see Worst brew day ever?). 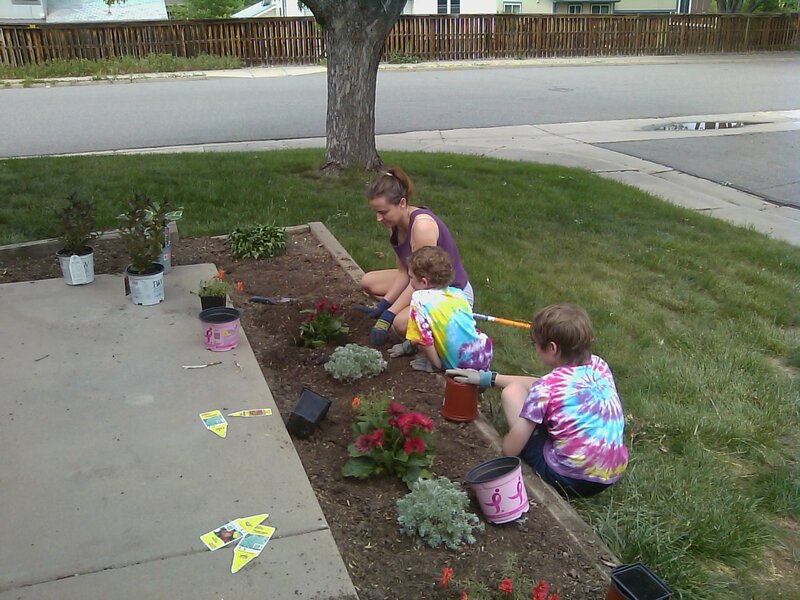 While I was cleaning up from my brew day, the beer model and the brewing assistants planted perennials on Sunday. Unfortunately, very few of the perennials that we plant in the front ever come up perennially. I guess the beer model still thinks that perhaps this is the year that the plants will survive to come up in the future. I think she is planning on making watering the plants one of the jobs on the kids' checklists so that at least they should get enough water through the summer. I guess we'll see. If they don't survive, I guess there is always next year. She is a Cubs fan after-all. So, I was looking at the Screwy Brewers blog and saw that he had a little box in the upper right hand corner that mentioned his local home brew shop (LHBS). I don't know how long that box has been there. I was sort of wondering if it was a sponsorship type thing, and my curiosity forced me to click on the link in that box. The link brought me to a blog post that Screwy had done back in December about his LHBS entitled "Joe Bair's 'Princeton Homebrew' LBHS". You may have noticed that The Screwy Brewer is one of those listed in the "Blogs I Read" section on my blog. It has been there awhile and I actually do remember when Screwy posted about his LBHS. At the time he did the post, I did not pay much attention to it, because I don't live anywhere close to New Jersey, so I did not think I would have much interest in reading about Screwy's LBHS. I had one of those "now why didn't I think of that" moments. Although, to be honest, I was sort of surpised that he had been able to focus the sun well enough to boil water, so even if I would have thought of the idea, I'm not sure I would have bothered following through on it. The black hose on the roof for mash water is probably something I could have thought of, though. Maybe. In the Jul/Aug 2010 issue, BYO magazine had an online article on Joe as well: "Last Call: Solar Brewing". I think that Jul/Aug 2010 must have been between my first subscription and second, right after I forgot to renew for a couple of months. I'm sure I would have remembered this article. Maybe. Anyway, since I am so slow on the uptake, you probably are already aware of Joe and his solar home brewing, or don't really care about it. I thought it was cool, though, so I thought I'd share.